I feel your pain, but if you can’t move, at least the value of your house is still going up. While I would be happy with a cap on all spending, the expenses listed are “Entitlements” or non-Discretionary Spending giving Congress less ability to hold down spending in those areas. They have trouble enough with the spending they control. I have written extensively elsewhere about control of Entitlements using a UBI which would grow at 0.9% after inflation. Specifically, SS growth would be controlled by a “painless tax”, UBI, and advancing FRA. I agree with you and Dan that we’ve got to hold down spending. The article is basically 100% right of course. TABOR has many flaws but it’s a far sight better than most other solutions. I voted against TABOR not once, but twice believing in all that representative government thing. I think TABOR may have been on the ballot three times before it finally passed. Today, you’d have to pry TABOR from my cold, dead, hanging chads. A downside to TABOR is in cities like Denver or Boulder, the voters never seem to see a tax hike they don’t like. 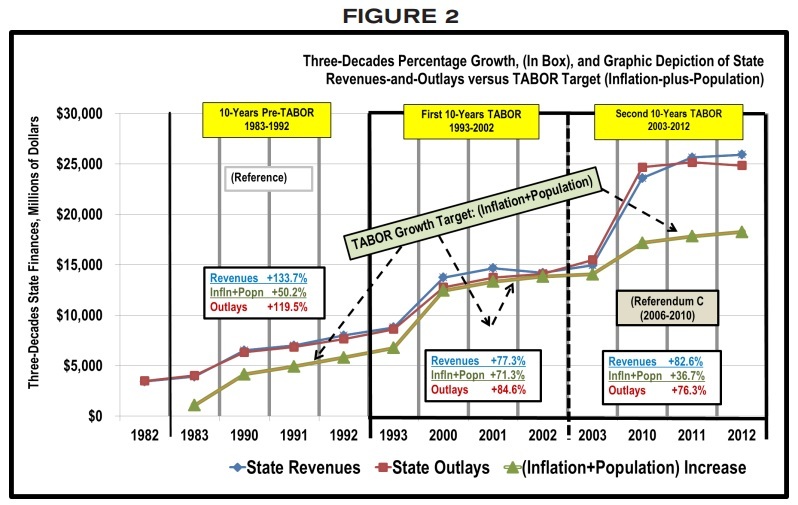 I can’t think of a tax hike that failed in Denver since the inception of TABOR. The argument is always, “It’s only .01%” or something akin to that. Pile on enough of those tax layers, here in Denver our sales tax is something like 8% and in some areas of metro Denver, my sales tax bill has been over 10%. Our Denver property tax levy was scheduled to go down this year, but the people voted last November to prevent that from happening. Another drawback to TABOR is the ability to “Debruce”, which in effect means your city or county can exempt itself from TABOR’s limitations by a vote of the people. Denver of course has done that. Just to note, because of rising home values in metro Denver over the past few years, my property taxes have doubled from this past year. But, I suppose it could have been worse. Politicians only benefit from spending, rarely for meeting the budget, if there is one. One way to make TABOR effective is to give legislators a bonus if budgets are met. 2x salary would certainly change attitudes. For the federal government, $250 million would be the bonus to limit +$1 trillion in Discretionary Spending.